Misinformation is perhaps the most common item found on the internet today. Fine if its about celebrity gossip... not so good if you are researching and spending money on parts for your baby... your JEEP! Hopefully we can dispel some misconceptions and actually properly inform on the subject of control arms and lifting. This picture shows the increased suspension travel the Rocky Road CAD system provides. The common misconception we are addressing here, is that long (control) arm kits are the best fix for front axle mounting on a lifted Jeep. Wrong! While aftermarket control arms can help with the castor alignment setting, they do nothing to help with the ride quality and tracking of the Jeep, and "long-arm" kits? No way. Read more on these things below. 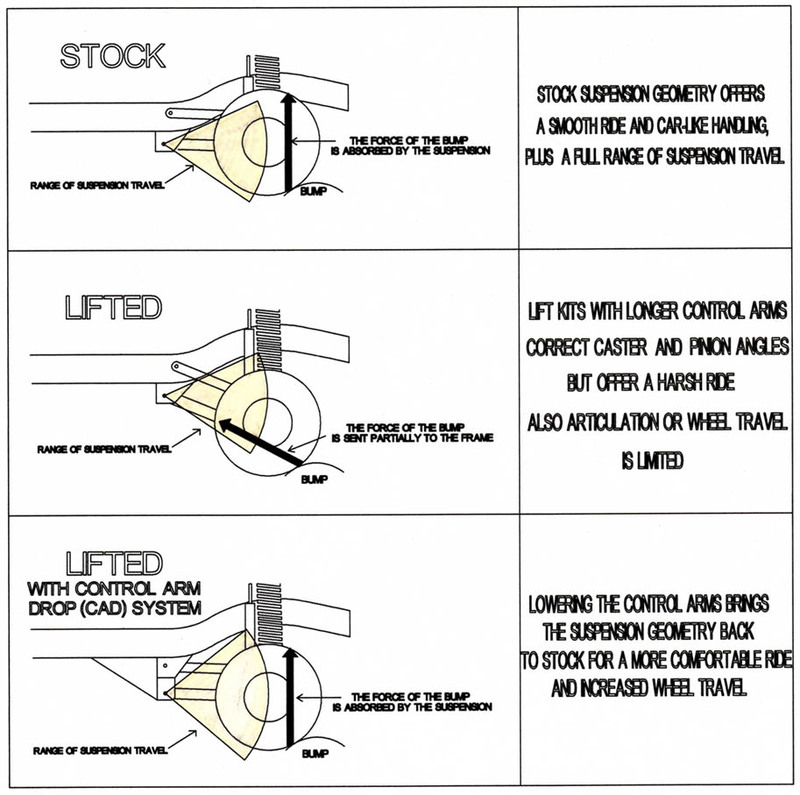 Here's what 4WD&Sport Utility magazine has to say about the Control Arm Drop system. "The control-arm relocation brackets have got to be one of the greatest bolt-ons for a lifted Cherokee. 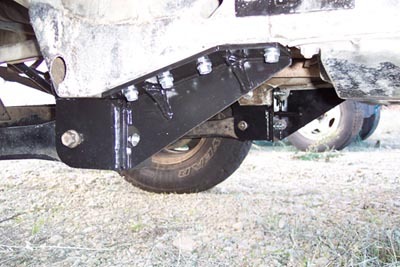 These steel relocation brackets bolt into place of the original control arms, and lower where your control arms mount. Bringing the control arms back to a more parallel position with the ground gives a much smoother ride & increases suspension droop." Not only did it relocate my front axle to the proper position under my XJ, but the ride improvements are incredible. The only minor problem I have is now I need to make some limiting straps, but all that means is that I have plenty of flex for the trail, so that problem isn't really a problem at all. WOW! Thanks for the incredible products!" If you view the front control arms on a stock Jeep, they sit at or very close to flat (parallel with the ground). The reason for this is control and ride quality. When you are driving, you want all the bumps and jolts to be absorbed by the springs and shocks. You do NOT want them transmitted up thru the rigid mounted control arm and into your frame (and from there right to you). Automobile engineers understand that flat arms do not transmit bad bumps and knocks into the frame. However, control arms that sit at a angle from frame to axle, end up transmitting a good deal of the impact energy (from bumps) up into the frame... and not thru the springs and shocks. Ultimately what this means is that your ride quality suffers. Which it really doesn't need to if the control arm issue had been properly addressed to begin with. It is a similar situation with tracking. The flatter the control arms sit, the better your Jeep will track and more stable it will feel at higher speeds. The Rocky Road CAD system flattens out the control arms to keep you riding as smooth as possible. Note on the picture below how flat the control arms are on this Jeep with about 6" of lift. CAD systems are appropriate for use on lifts 4" or taller. We would not recommend the system for anything less than 4", but the taller your lift, the more this system makes sense for optimal ride quality and handling. Rocky Road systems come with the rear mounted brace and skid guard. Other kits on the market charge additional for these items and make them an option. Our testing indicates that this cannot really be an 'optional' item. It is required for not only a full strength mounting system, but also for the best trail handling. As you can see from the photo to the right down below, the back-up brace provides a "skidplate" for the control arm drop so it doesn't get caught or hung up on trail obstacles. Without this rear bracing, all sorts of problems can occur on your control arm mounting. At Rocky Road, we provide not only the full proper mounting system, but MUCH MUCH easier to install. The engineering on the Rocky Road system just crushes anything else on the market. So why do most 4x4 shops only sell control arms? Why not even mention the control arm drops when they are the clear better choice? Most 4x4 shops don't care as much about providing you with the best system (one big reason why there are so many stiff riding suspensions on the market) as they care about their bottom line. Control arms are super cheap to make. Some tubing and bushings and a price tag of a few hundred bucks. Doesn't take much engineering, thought, or effort to make control arms. 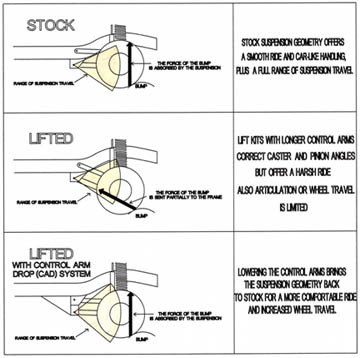 To the left is a diagram that shows how the CAD system is far superior to simply using longer control arms. Diagram explains how the proper geometry works. Click on the illustration for a better view. In the flip side, control arm drop systems require a substantial amount of engineering and have far more complex construction. This makes them more expensive to produce which to be competitive, ultimately means less profit margin. So most shops will take the easy way out, and sell high margin longer arms. On another subject... We do get alot of folks asking about "long-arm" kits. Our response is that these systems work OK if your one and only focus is a trail vehicle. If safety isn't much of an issue, if highway control and stability are not important, then the long-arm kits may be for you. While they do look impressive parked on a flex ramp or posing in a magazine ad, these kits do not allow your suspension to cycle up and down in the manner in which it was designed. So they can ride a bit spooky at highway speeds. Picture shows the Rocky Road CAD system mounted on a Comanche. We make kits for both Cherokees and Comanches. This may all sound a bit harsh considering the buzz surrounding long-arm kits and the huge marketing efforts (and expense) that go into trying to sell them, but its not just our opinion. 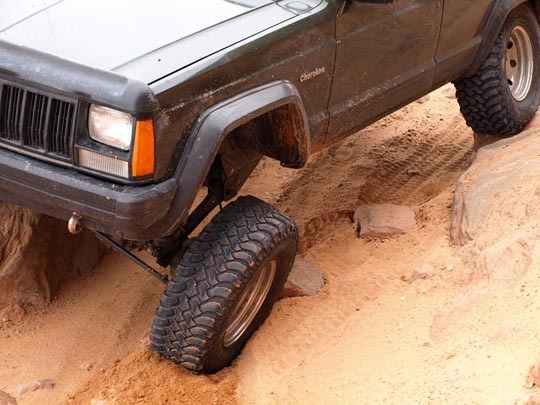 Both 4WD&Sport Utility and JP Magazines have run articles comparing the appropriate usage of long-arm kits to proper length control arm kits... both with the same final opinion that we've always had. So, if what you want is to build a trailered trail-rig and not necessarily an all-around performer... yes, a long-arm kit may be for you. We won't sell them though since we'd never run them on our own Jeeps.... we will stick with a proper Control Arm Drop system for our Jeeps. The Rocky Road CAD system is simply the best way to correct front end geometry. Now that we all understand the superiority of control arm drop systems, how does the Rocky Road CAD system stack up against other control arm drop kits? To be fair, they all do the same job in the end. All are built extremely beefy so there is never a question of strength. However, do some research on our competitor's kits and you will find alot of complaints about difficult and frustrating installations. They use some funky shaped pieces for the upper control arm mount that makes the thing darn near impossible to install!!! Their design will add hours of frustration and time to what could otherwise be a simple installation. Our systems are easy to install, come with complete hardware, AND come with the adjustment sleeve for 100% perfect alignment adjustability. As mentioned earlier, we also provide the backing brace in our kit. In a nutshell, there is not a better designed system nor easier to install than the Rocky Road CAD. As with most things in life... there is a right way and a wrong way to solve problems. If you are looking to correct your control arms for 4" or larger lifts, then a Rocky Road CAD system is the 'right way'. We do offer optional replacement lower control arms. Not really needed for lifts below 6" when you have our CAD system on the Cherokee or below 5" on the Comanche. However, on those taller lifts, our lower control arms will help with your alignment specifications as well as combat the dreaded death-wobble so common on the very tall lifts. You can view all the information on our control arm selections direct from our webpage .